"It's the most perfect form a spy could take…!" 20th Century Fox has unveiled the first official trailer for next big animated movie form Blue Sky Studios, titled Spies In Disguise. This one has been in the works for a few years and is about the relationship between a super spy and the super smart guy who makes all his gadgets and handles all his technology. Here's the introductory synopsis: Lance and Walter. One is a super cool and charming spy, and the other invents the super cool gadgets Lance uses. When an event happens, they must learn to rely on each other like never before in order to save the world. Will Smith voices Lance, and Tom Holland voices Walter. The full voice cast includes Ben Mendelsohn, Karen Gillan, Rashida Jones, DJ Khaled, and Masi Oka. Inspired by the short film Pigeon: Impossible, the actual plot involves Lance being turned into a bird by accident. Super fun, right? I hope this turns out better than it looks so far. Charming, super cool, super spy Lance Sterling (Will Smith) and scientist Walter Beckett (Tom Holland) are almost exact opposites. Lance is smooth, suave and debonair. Walter is… not. But what Walter lacks in social skills he makes up for in smarts and invention, creating the awesome gadgets Lance uses on his epic missions. But when events take an unexpected turn, Walter and Lance suddenly have to rely on each other in a whole new way. And if this odd couple can't learn to work as a team, the whole world is in peril. Spies In Disguise is an animated comedy set in the high-octane globe-trotting world of international espionage. 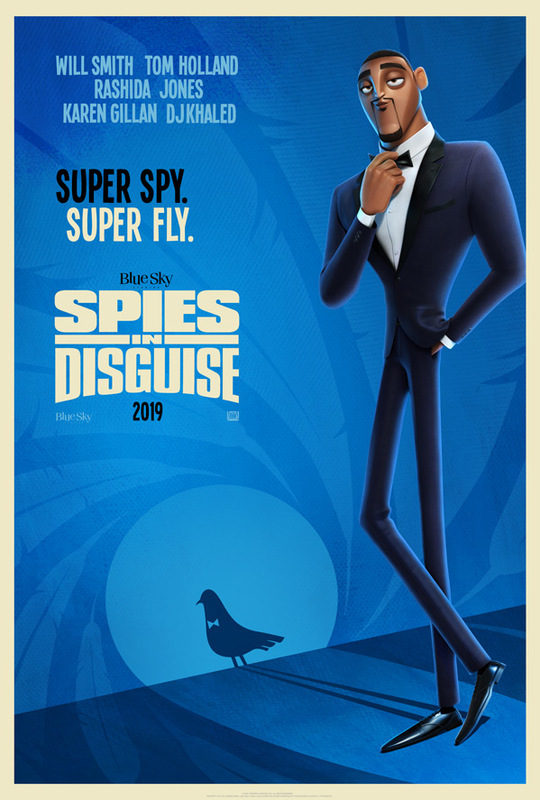 Spies In Disguise is co-directed by filmmakers Nick Bruno & Troy Quane, from Blue Sky Studios. Inspired by the animated short film Pigeon: Impossible by Lucas Martell. 20th Century Fox will release Blue Sky's Spies In Disguise in theaters everywhere starting September 13th, 2019 next fall. First impression? Cool?